We finally made it to The Backroom at Moody’s and I’m wondering what took us so long? In a nutshell great food, friendly and knowledgeable service, comfortable lively atmosphere. They really did a nice job with the space. We sat at a four top along the wall, but the bar is beautifully done. I’ll look forward to sitting there next time. We were having a tough time deciding what to order, so we asked the waiter to bring an assortment of his favorite charcuterie and cheeses. Rather than just running off, he asked a few qualifying questions (pate OK or just meat? ; spick OK? ; stinky cheese?). We enjoyed all his selections, with the Coppa and Fig & Foie Pate being favorites for meat, and the Pont L’eveque was a standout cheese. Other dishes we tried included the Fluke Crudo (excellent complex flavors such as the pickled shisto peppers, however the fluke flavor got a bit masked, could have used larger cuts of fish); Bacon & Eggs Bolognese (thanks for the rec Boston Eater, the pasta was perfectly done and I’ll eat anything into which I can mix a perfectly poached egg); Sausage Stuffed Delicata Squash (wow!, best stuffed vegetable I have had, buttery breadcrumbs mmmmm); Smoked Wagyu Brisket (mouthwatering). We tried the previously discussed Meatballs. In another thread it was commented that they were good, but “how meatballs are supposed to taste” and “they taste the same as the ones I make at home”. The meatballs were excellent, and had a luscious quality not found in most meatballs I’ve had. There are definitely some non traditional cuts of meat in there. If someone makes meatballs like that at home, you’re a hell of a cook and I’ll be over for dinner soon. I preferred these meatballs to the ones at Coppa. The wine list is just great. All the selections are appealing, drinkable and moderately priced. You can throw a dart and score on this list. We had a few of their fuller bodied Pinot Noirs which went well with all of our dishes. They had a nice selection of tequila and scotch, which are my preferred spirits. It’s tough to find things to quibble with about our meal. One thing to note is that this is not a place to bring people who don’t like meat. Even the squash was stuffed with sausage. They could expand their beer selections a bit, the selection is quite limited particularly compared to the well rounded wine and alcohol offerings. We asked for more bread a few times in order to sop up the goodness of the meatballs and brisket, not that this was an issue. All said, I’m ready to go back. This is definitely where I’ll be going for my next birthday. We have reservations next Tuesday. Looking forward to the Delicata squash. And also to note, I believed this Sunday coming up, they are doing a brunch. Could be fun. Still one of my favorite places. On some thread (too hard to find again, so posting here) one HO mentioned they were opening another concept next door - a raw bar/oyster place. I was there today and talked to a staff member - apparently the plan could be to open three new concepts in the three adjacent spaces (all spaces papered up with construction permits posted)!!! One a ceviche/raw bar, a BBQ place, and a taqueria place. He wasn’t clear if they would be connected internally or three side by side concepts. Either way - very excited about those possibilities. Target openings in Oct (rumored). So cool. I say, let Moody’s take over Moody Street! A friend and I stopped into Moody’s on Saturday at lunchtime to grab a bite. They were seating folks in the Backroom space to order off the deli menu with wait staff service. (You could still do counter ordering and sit in the deli part.) We sat at the very comfortable bar and ordered pork tacos off the “pop-up taco menu” which the waiter told us they had done for the past 3 Saturdays to publicize the opening of the new taco bar in the fall. We got two small but incredibly wonderful tacos with braised pork short rib, tomatillo sauce, pickled red onions and crumbled cotija cheese. We should have ordered all 3 on offer (a smoked chicken and a beef, don’t remember accompaniments) but had opted to share a bahn mi. The bahn mi was very good but did not deliver the flavor punch of those tacos. The waiter was unsure if they’d be offering them again but it might be worth a call Saturday morning if you are going to be over there. And I can hardly wait till they open the taco bar! We also got some corned beef and Montreal Smoked Meat to go and had a taste-off last night. Both excellent but for me, the Montreal Smoked Meat edged out the win. Can’t go wrong with either one though. And I can hardly wait till they open the taco bar! Awesome report, Gretchen. I’m even more psyched for all the additions! We went last night. The folks I was with did not want to order any of the crudo but we started with delicious oysters from Maine - I don’t recall their name and an assortment of charcuterie which was great, of course. We had the Frankfurt Plate, which was fine - I wouldn’t have ordered that myself. Pappardelle with Braised Oxtail. I thought the pappardelle were a little too thick and there wasn’t enough oxtail sauce on them to make up for that. There are so many things I want to try when I go back! What I will definitely repeat: The incredible Meatballs which are indeed praiseworthy. And the Duck Cassoulet! So good. The paper was off of the taco/deli today! The bar is stocked and there was some cooking going on in the kitchen. The young woman at the register had her hands full with the lunch crew so we didn’t get a chance to ask about an opening date. The paper was off of the taco/deli today! Oh, no! We went back for a breakfast sandwich this morning and realized that we were looking at the oyster bar. The windows to the taqueria/deli are still covered. Sorry for the false excitement! We were back at Moody’s for the first time since the expanded space with the oyster bar opened. While they did a beautiful job with the new space and the extra seating is nice, there was a hint of something lost in terms of the specialness of the original more intimate Backroom space. That’s likely just nostalgia on my part though. The expanded crudo selection and oysters are welcome additions to the menu, offering options to lighten up an otherwise heavy meal quite a bit. The oysters were all expertly shucked (no shell and retaining all liquor), pristinely fresh and served rather quickly. It seems simple enough to get oysters right, but so many places do not. We tried and enjoyed all 4 east coast oysters offered that night. I like how they just focus on the local oysters. I’ll eat west coast oysters when I’m on the west coast. We tried 3 of the 4 crudos offered. As run of the mill as tuna can be, yellowfin with miso, soy sauce, sesame oil, scallions was our favorite, with the beautiful fish and accompaniments in perfect balance. The Maine scallop seemed fresh but disappointingly lacked any scallop flavor. With all of the relatively overpriced places in opening in Cambridge in Boston, I forget how good a value Moody’s is. The meal came to about $130 per couple. When taking into account that in addition to the above that included some charcuterie, cheese, 3 pastas and entrees, and 8 cocktails/glasses of wine, we thought the value was exceptional. With all of the relatively overpriced places in opening in Cambridge in Boston, I forget how good a value Moody’s is. Thank you for this detailed review of the expanded Moody’s. My husband and I pick up their charcuterie to take away for enjoyment at home but haven’t been for dinner. (I did dine in for lunch just once.) Sounds like dining on the premises is worth doing to savor those oysters alongside what we consider to be the tastiest charcuterie we’ve had yet. Went for the first time and really enjoyed the Backroom - great food and relaxed, slow paced service. The only disappointment was the crudo - not well executed, not well balanced and appeared more like somebody wanted to put something on the menu with crudos but doesn’t really know how to do it. I had the same experience recently. But everything else was great! Someone on CH just posted a picture of BROCCOLI & BURRATA FLATBREAD, but no comment on taste. Looks fabulous - anyone try it? We stopped in at the Backroom for a charcuterie board and pastrami/swiss pizza on Tuesday night. The food was stellar, as usual, and service was lovely. It was hard to feel like date-night, though, with the booming bass of the hip hop soundtrack. I think we’ll stick to breakfast/lunch time with the mellow music of the 70’s. 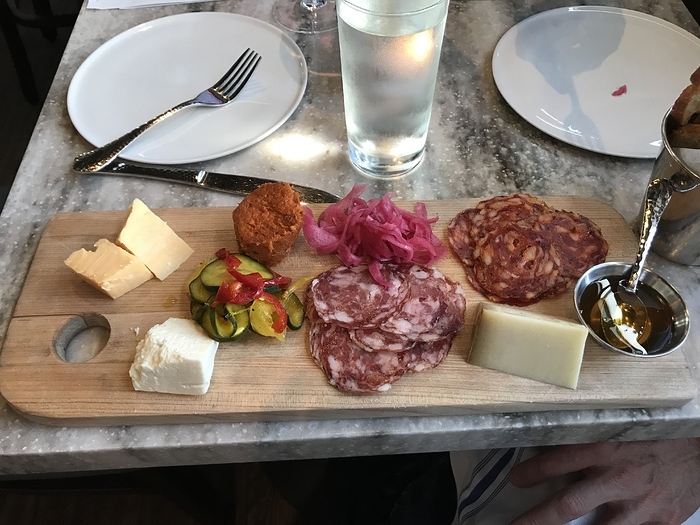 Do I spy a chunk of ’nduja and pickled onions among the items on that charcuterie board? Those are two of our favorites to keep in the fridge to fancy up meals at home. Uses for ‘nduja are as many as you care to think of, including for enriching quick pasta sauces. Those red onions we love for their brightness on top of a green salad or a Greek village salad. And at home the music playlist can be anything you want, so that’s not bad either. Do you pickle your own onions, or buy them (which brand)? I have been meaning to do quick pickled onions but have not so far. The ones in @bear’s photo I recognize from Moody’s. Usually they have had them for sale in their fridge case. I want to try my hand at imitating those at home when local onions are back in season.